Using a journal style format, with drawings and photographs accompanying short, thematic chapters, Granirer begins by relaying family histories entwined with accounts of Europe’s shifting political landscape. Born in Braila, Romania in 1935 to Lascar and Carola Solomon, Granirer was an only child. Her Jewish-Romanian parents were a love match, defying their parental plans for an arranged marriage. In another part of Europe, German leader Adolf Hitler had begun implementing anti-Semitic laws which would lead to the systematic mass-murder of European Jews. “Houses are secret realms of fantasy and imagination for children,” Granirer writes about the stately two-storey home her family rented in Braila when she was five years old. The house was designed by an Italian architect and owned by a Greek. She grew up alongside other relations, including a female cousin who was like a sister to her. An observant child, Granirer describes secrets within the extended family too. She felt protected and safe, especially trusting of her mother’s strength. Within this atmosphere, Granirer developed a talent for drawing. After the World War Two broke out, Romania formed an alliance with the Nazis and Granirer remembers her family scrambling into the basement as American bomber planes flew over the city, followed by occupation by Russian soldiers at war’s end. “A rare oasis in the eye of the hurricane, Braila was a city where most Jews would somehow survive the disasters of war,” she writes. Granirer only learned the full impact of the holocaust on Romanian Jews years later while living in the United States, after reading of I.C. Butnaru’s book, The Silent Holocaust: Romania and its Jews (Greenwood Press, 1992). Life continued for the author and her family as Romania came under control of Russia’s communist government. Israel was founded in 1948 and a short time later, the opportunistic Romanian regime accepted money from the young country’s government in return for permitting Romanian Jews to emigrate there. Granirer’s father had already escaped to Israel when the author and her mother followed in 1950 under this agreement. The second phase of Granirer’s life began as she attended high school while living with her parents in a suburb of Haifa. Granirer fulfilled compulsory military duty, married Eddy Granirer, and attended art college in Jerusalem. Her life was carefree and creative. Opportunities in academia for her husband were scarce, however. When the young couple reluctantly moved to the United States, they believed they would return one day. Granirer studied the layers of ancient religions and mythologies, including those of the First Nations of the west coast, to illustrate ideas around the biblical story of Eve. The result is a rich visual narrative that has resonated widely and resulted in a book and a film. 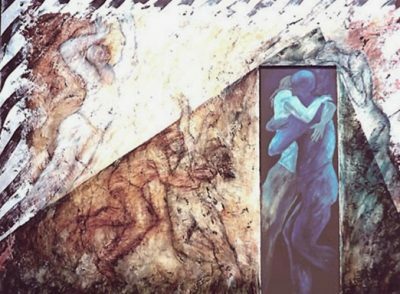 More inspiration followed, including a depiction of the mystery and beauty of coastal stones in a series of drawings entitled The Carved Stones, a trio of panels with images based on the Holocaust entitled Out of the Flames, and a series of figure drawings called The Dancers Suite. 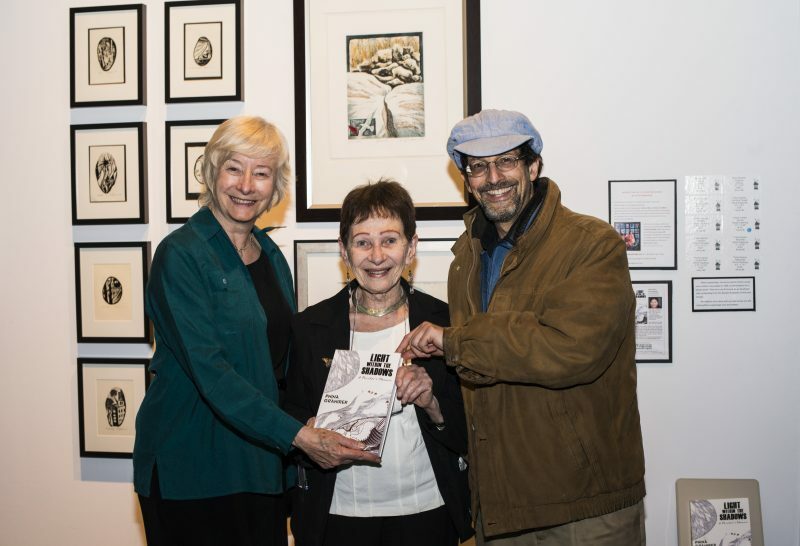 Publisher Jo Blackmore (left) with Pnina Granirer and publicist David Litvak at Artists in our Midst. Granirer is co-founder of Artists in Our Midst, an annual event, now in its twentieth year, on Vancouver’s west side. Artists open their homes and studios to the community over a weekend in June. Although Granirer has achieved much since leaving Europe as a teenager, she provides a satisfactory conclusion to her memoir by recounting her 2015 visit to Romania. She succeeded in viewing her childhood home in Braila and found people who remembered her and her family. Returning to Vancouver, she reflects on her mortality and life’s mysteries. 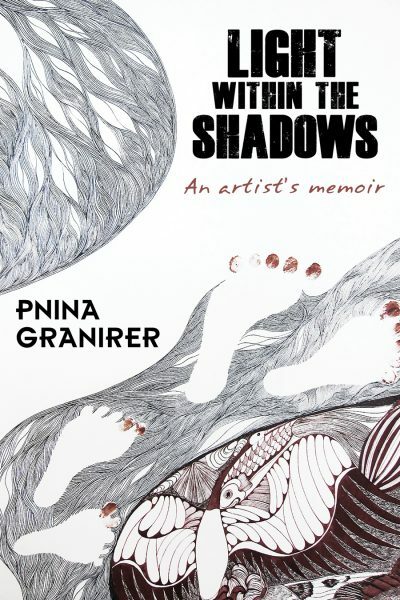 Granirer’s writing — and art work — has undoubtedly helped her in this rumination. Readers are rewarded too, with an enlightening and insightful story of an artist’s life.